What are the Differences Between Catholics and Christians? Initially, it may be confusing to understand how Catholicism relates to Christianity. When you ask Protestants what religion they are, most of them will say, “Christian.” When you ask Catholics the same question, however, nearly all of them will identify as “Catholic.” Yet Catholics believe in Jesus and read the Bible. So how does Catholicism relate to Christianity? In fact, there are many kinds of Christianity. There are several kinds of Protestants, and these different types of Protestants do not always agree with each other. There are various branches of Eastern Orthodoxy. Generally speaking, Catholics and Orthodox have more in common than Catholics and Protestants do. Finally, there are Catholics. You are probably familiar with Roman Catholics but there are also Eastern Catholics. There are several types of Eastern Catholicism, and they are very similar to Eastern Orthodoxy but they are in communion with the Pope. So the answer to the question, “What is the difference between Catholics and Christians?” in short is, “There are no differences. Catholics are Christians.” Indeed, Catholics believe that while other Christians are really and truly followers of Christ, the Catholic Church alone possesses (as a gift from Jesus Christ himself) the fullness of the truth Jesus came to reveal. Even though Catholics are Christians, Catholics may seem very different than other Christians. Let’s look at some of these differences. Because most of the non-Catholic Christians you will meet are probably Protestants, we’ll focus on how Catholic beliefs relate to Protestant beliefs. While there are many differences, we will look here at two of the major ones: the role of Scripture and the role of good works. Catholics and Protestants both believe that the Bible is the word of God. Protestants believe that the Bible is the only source of revelation about faith and morals. This is called sola scriptura, meaning “Scripture alone.” Catholics, on the other hand, believe that God’s revelation comes to us in two ways: Sacred Scripture and Sacred Tradition. Therefore, Catholics believe that the Church has the authority to interpret Scripture and to decide when an interpretation of Scripture is false. For Protestants, on the other hand, what their pastors or Church leaders say is a valuable source of guidance and can be a lens through which to look at Scripture, but these sources do not have the same authority for Protestants that the Catholic Church has for Catholics. It is true that some Catholics do not know the Bible very well. The Church encourages all Catholics to read and learn more about the Bible. One way she does this is by presenting the Bible to Catholics at every liturgy. The Bible is an important part of every Mass. First and foremost, the Scriptures are read at every Mass. Over the course of three years, a Catholic who goes to Roman Catholic Mass every Sunday will hear around 15% of the verses in the Bible, and over 40% of the verses in the New Testament. 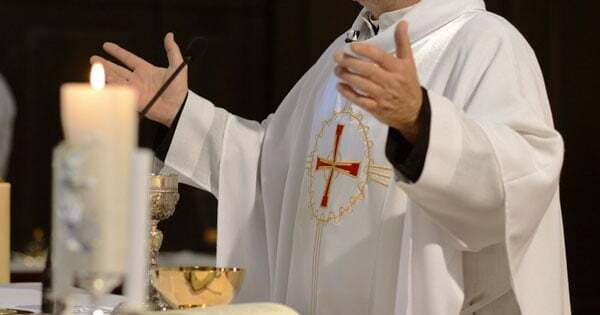 A Catholic who goes to Mass every day, including Sundays, will hear around one third of the verses in the Bible and almost three quarters of the verses in the New Testament. Furthermore, the entire Mass has Scripture woven throughout. For example, when he elevates the Eucharist, the priest will say, “Behold the Lamb of God, behold him who takes away the sins of the world. Blessed are those called to the supper of the Lamb.” This echoes John the Baptist’s words in the Gospel of John: “Behold the Lamb of God, who takes away the sin of the world” (Jn 1:29). In the book of Revelation, an angel says, “Blessed are those who have been called to the wedding feast of the Lamb” (Rev 19:9). The people’s response (“Lord, I am not worthy that you should enter under my roof, but only say the word and my soul shall be healed”) is also Biblical: it is similar to what a centurion tells Jesus when asking Jesus to heal his servant (see Luke 7). Another important and significant difference between Catholics and many other Christians is their theology of faith and works. One of the central tenets of the Protestant Reformation was sola fide, meaning “by faith alone.” What this means is that we are saved, or justified, by faith alone and not by works. Catholics, on the other hand, believe that both faith and works are necessary for salvation. Many people, even many Catholics, misunderstand the Catholic Church’s teaching and believe that according to the Catholic Church, we have to earn our way to heaven. This is not at all what the Church teaches. Our salvation is a work entirely of God’s grace, but God’s saving grace requires a response from us. Faith is essential to that response, but so are actions (works). Actions are not just evidence that we believe. They are a key element in working out our salvation (cf. Philippians 2:12). In fact, the only time the words “faith alone” appear together in the New Testament is in the book of James, which says, “See how a person is justified by works and not by faith alone” (2:24). Sola Scriptura and Sola Fide are often sources of debate between Catholics and Protestant Christians. Of course, there is far more to these debates than a short essay can convey. Despite these debates, be assured that Catholics are Christians! Like our brothers and sisters who are Protestant, we love the Bible, and we worship Jesus Christ as our Lord and God and trust in his power to save us.